Cocoa butter has a high melting point of approximately 95.0–97.7 °F which makes it brittle at room temperature. When melting cocoa butter for beauty recipes, it’s best to temper it (as you do with chocolate) to prevent crystallization. Cocoa butter tends to crystallize due to its fatty acid profile. Simply put, the fats in cocoa butter melt and solidify at different temperatures, which can lead to fatty acids forming large clumps. 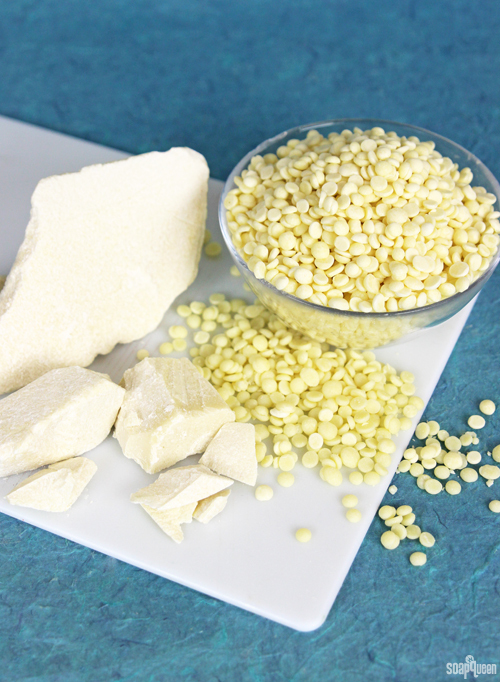 To read more about why cocoa butter crystallizes, click here. Tempering the cocoa butter helps ensure your final product (lip butters in particular) is smooth, not grainy. However, in cold process soap, no tempering is needed. In cold process soap, cocoa butter adds firmness and moisture to the bar. We recommend using cocoa butter at 15% or less; any higher may lead to cracking in the final product. 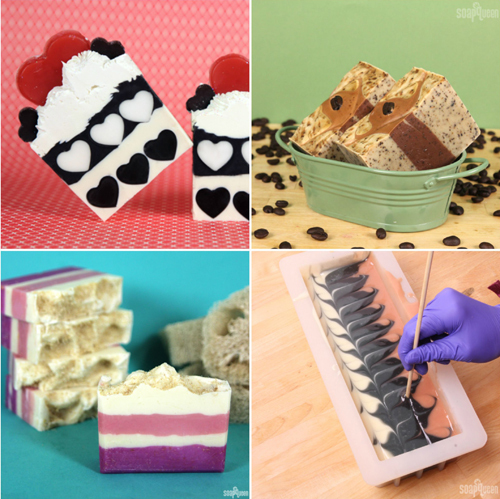 Both palm-free recipes, the Queen of Hearts and Layered Lilac Loofah Cold Process soaps contain cocoa butter to give the bars hardness. In the Espresso Shot Cold Process and Natural Colorant Taiwan Swirl tutorials, cocoa butter is used for moisture and firming abilities. Due to its moisturizing abilities, cocoa butter makes a great addition to leave-on body products. 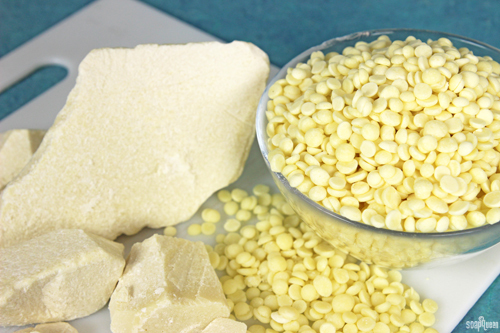 Because of its hard texture, cocoa butter is perfect for creating thick-textured body butters and creams. 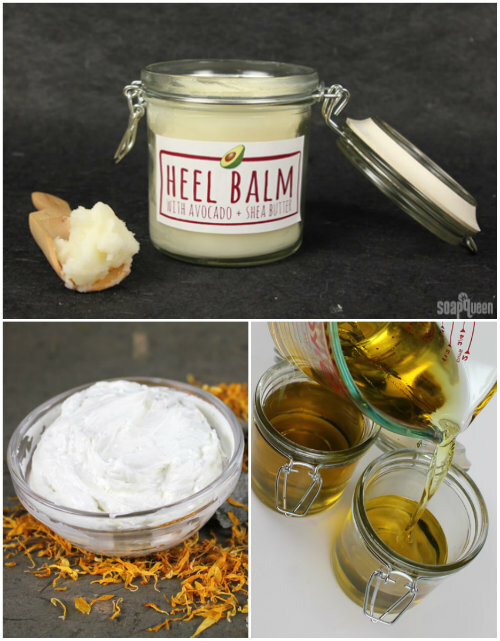 In the Moisturizing Heel Butter, cocoa butter is used to help create a firm yet spreadable texture that’s perfect for cracked, dry heels. Cocoa butter is also used in the Bramble Baby Belly Butter and Everything Balm, two leave-on creams that are both hydrating. Looking for even more leave-on body products featuring cocoa butter? We’ve got you covered! The Mango Avocado Balmy Salve uses a combination of both hard butters like cocoa butter, and luxurious soft oils such as jojoba oil to create a creamy and skin-loving product. 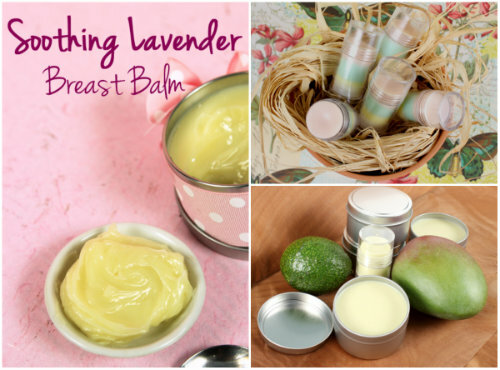 The Soothing Lavender Breast Balm has a similar texture to petroleum jelly, and is scented with soothing Hungarian Lavender Essential Oil. In the Lotion Bar Love tutorial, micas and Summer Fling Fragrance Oil are used to create a lotion bar that’s both colorful and fruity. 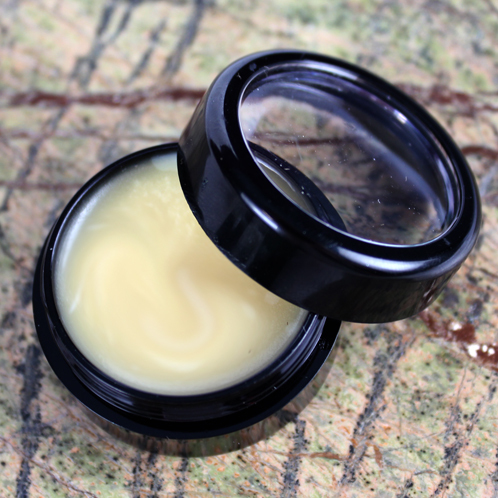 If lips are feeling dry and cracked, cocoa butter gives lip balms a firm and luxurious texture. In the Vanilla Latte Lip Balm tutorial, cocoa butter and coffee butter come together to create a silky texture and naturally delicious smelling lip product. It smells like a mocha! What is your favorite way to use cocoa butter? Personally, I love using it in my cold process soap recipes for firmness and moisturizing abilities! Hi, I’ve often heard that cocoa butter should be used at night, because while it’s on your skin when exposed to sunlight, it tends to have a tanning effect. This worries me about using it in lip balms and other lip products. Does this mean that adding cocoa butter to my lip products will cause my lips to turn dark? I hope you respond soon,as this is a major concern of mine. Is there any place to buy fractionated cocoa butter? Also, I was wondering if I do this will it make my lip balm more oily than if I just melted the cocoa butter with the rest of the ingredients in the balm and put in into tubes? already tempered* not fractionated. Unless they are the same thing? You recommend using this at 15% or less in soap–I assume that means 15% of the total formula, right? Not 15% of the base oils? Also… If you plan on superfatting your soap should you lower the amount of cocoa butter? Is cocoa butter considered a superfat? I’m planning on using jojoba oil to superfat my soap around 5%, but I also want to incorporate cocoa butter into my recipe. How would you recommend I balance the two? I’ve read that cocoa butter on it’s own is comedogenic–That’s not true for saponified cocoa butter, right? This is great thank you! I got a questionably stored batch from a local supplier where it looks like they melted their butters and stored them in plastic containers for purchasing. I’d love to go ahead and temper these and perhaps put them into small molds to make smaller bars. Can I do that? Or does the butter need to be immediately used? If I need to melt the butters again, will it affect them badly? That’s a relief! Thank you so much! Wow!! Thank you SO much for the very informative response, Amanda!! 🙂 I am going to whip up a batch of lip balm today and try this out! Thanks! I purchased a couple of pounds of cocoa butter. I would like to melt it down and make smaller cubes. After reading your article, it appears that tempering it would be best during this process. What do you think the best method would be for heating the cocoa butter slowly (crock pot on warm or double boiler)? Also, does it affect the tempering to move the liquid cocoa butter to ice cube trays during the cool off period? Thank you so much for your informative articles! Should cocoa butter be tempered if it’s used as a superfat after the cook in hot process? You can temper your cocoa butter if you like! Cocoa butter tends to get grainy if it’s heated too much or too quickly. With hot process soaping, the temperature is usually around 160F, and you’re adding it when the soap is cooling down. That is a fairly gentle environment, and shouldn’t cause graininess! Thank you for your troubleshooting tips! Been making body lotion that turned out bumpy/grainy and needed some direction. I so appreciate the help! Note: To avoid crystallization when melting cocoa butter, it is best to temper it. It’s simple to do: raise the temperature on your melting cocoa butter slowly, over 45 minutes. Then, turn the heat off, cover the cocoa butter and let it cool for approximately 10 minutes. Use this method to achieve smoother lotion and lip balms. I also would like an answer to Alicia’s question. I have had the same problem with a couple of my lotion bars. Any help would be greatly appreciated. This is the first that I had heard of tempering the cocoa butter and all of the recipes do not explain that either. Could you please provide some tips on tempering? I make lotion bars that begin with melting beeswax in a double boiler, than I add cocoa butter to the melted beeswax and melt that, then mango butter and melt, and a variety of other oils. I’ve noticed that some of my older bars have gotten grainy, and I believe it has something to do with temperature changes in the room where they are stored during summer/fall. Could that cause graininess? Is that ‘fat bloom’? How can I prevent this? I’d hate to have to throw out a bunch of stock because they are unpleasant to use. I’ve tried melting them down again and remolding, which seemed to help on the surface, but the graininess returns. Any help would be greatly appreciated! Jocelyn is correct – to temper your cocoa butter, raise the temperature slowly, over 45 minutes. Then, turn the heat off, cover the cocoa butter and let it cool for about 10 minutes. Also, temperature can definitely affect graininess of the cocoa butter. After your butter is tempered, put it in the fridge or freezer to cool. Then, store it in a cool, dark place until you need to use it. That helps prevent the graininess. Hope that helps!